Revisiting familiar places is always fun. This time we made our first trip out to the Majorville Medicine Wheel since November of 2016. Last time we were with our friend Richard Hansen, this time we brough Chris and Connie of BigDoer.com along with Emily’s parents to join us on the trip. We noticed a couple of changes since our last visit. The biggest change was the addition of signage as you get closer to the medicine wheel, showing which directions to take to get to the site. When we were here in 2016, there was nothing to mark the way. In conjunction with the new signs, the side tracks which branched off from the main “road” in are now signed as “No Motorized Vehicles”. I guess they really want to limit how traffic approaches the site as to limit the damage done to the native prairie grasses. 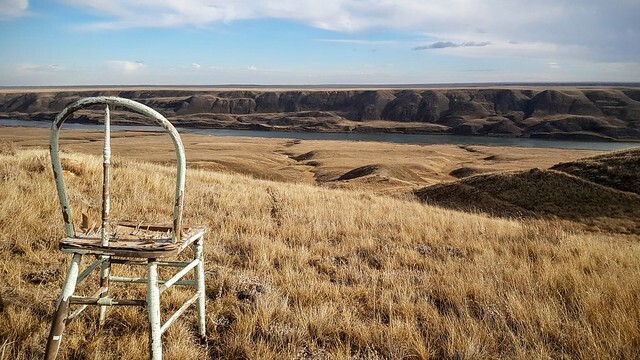 Overall, I don’t mind the changes, although it means we would have had to walk out more than a kilometer if we wanted to see if “the chair” is still present and looking out over the Bow River. We simply didn’t have time. The biggest reason I wanted to revisit this site is that I wanted the chance to see it from the air with the drone. And, as you can see in the video below, there was plenty of opportunity to get out and fly. That’s it for now. Summer is rapidly coming to a close but we still have some more exploration and history to share before the snow flies. Stay tuned! Thanks for reading and watching. This entry was posted in History, Travel and tagged Alberta, Bassano, Blackfoot Crossing Historical Park, cairn, Canada, chickens, Cluny, DJI, DJI Mavic Pro, drone, history, Majorville, Majorville Medicine Wheel, Mavic, Mavic Pro, medicine wheel, Siksika. Bookmark the permalink.